We offer a range of functionalities that help finance departments cope with the variable nature of Cloud expenses and automate things in order to save time. Define classifications for your costs and allocate them to any cost center you define (teams, projects, activity type, country, ...). You can gather costs from several cloud accounts under a single cost center or split sub-costs (compute, storage, ...) from one account accross several cost centers. 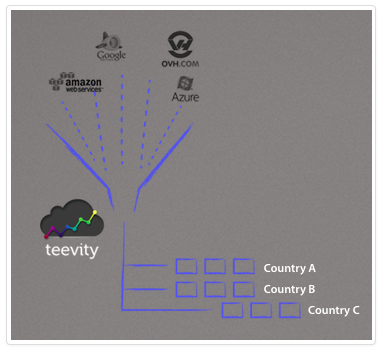 Once your cost classification is defined, Teevity does the cost classification for you, in real-time. Segmented cost analytics : your Teevity dashboard becomes cost-center aware, so does your daily email and the data you get access to from our API. If you mix the 'cost data' we gather with relevant business data (probably from your applications logs), you can compute 'cost per transactions', 'cost per tenant' or other sorts of 'cost per item' values. We integrate with Google BigQuery so that you can run any request you want, regardless of the volume of your data. More an more projects need to use cloud-based infrastructure. And sometimes, even fixed price projects have to use it. We give you the tools to ensure you have the tightest control of these projects margins, right inside your spreadsheets. We integrate with Excel and Google Spreadsheet to let you benefit from always up-to-date cost data. You get 'historical and current' cost data and also 'projected' cost data we compute for you. End-of-year fiscal closing is upon you and you have to gather all your cloud bills ? Or maybe you have to give that customers all the cloud-related bills you are charging him/her back ? You will for sure enjoy using our bill-gathering feature and its seemless integration with Dropbox. We make all your Cloud bills magically appear inside your preferred location inside your Dropbox. And we structure all of these bills following the cost allocation definitions you have made to simplify even further your work. 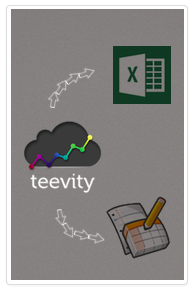 As detailled above, we integrate with Excel and Google Spreadsheet. You no longer have to consumme valuable time gatheting cost data from various providers to have your cost reports up-to-date. Make your cost and usage data work for you ! Make use of our API to make this cost and usage data work for you ! Integration with your development information to give specific cost-feedback to your dev team ? Special charge-back scenario for a particular customer ? Integration with your favoriate dashboard ? Feel free to let us know what you do with it. We are @teevity on twitter or you can shoot us an email at feedback@teevity.com !